Recently, I was at a wedding of two dear friends who have been together since our university days. As expected, it was a truly memorable evening complete with endlessly flowing champagne, delicious food, candle light,Â speeches – some touching others downright hilarious, twinkling views of Sydney harbour, and a chance to catch up with old friends both local andÂ scattered around the globe. One thing that struck me was how interesting most people’s career paths have become. Sure thereÂ are a few law students now all grown-up lawyers but mostly there had been a few interesting twists and turns on the way. All good examples of how sometimes life can surprise you. One of my favourite cookbook acquisitions this year is the whimsically named Wild Weed Pie: a lifetimeÂ of recipes from a chef with a very unlikely career path. Janni Kyritsis came to Australia at the tender age of 24. Trained as an electrician in his homeland of Greece and unable to speak English, he somehow stumbled into a job in the kitchen of the great Stephanie Alexander at Stephanie’s in Melbourne. After five years manning the pans under Stephanie, young Janni headed north to work with another pioneering lady of the Australian food scene: Gay Bilson. At the legendary Berowra Water’s Inn and afterwards the glam Bennelong in Sydney’s iconic Opera House he further honed his skills before venturing to open his very own place. MG Garage, in Surry Hills was one of my favourite high end dining experiences. And while I was only lucky enough to dine there a handful of times before Janni left the kitchen in 2002, the food was always spot on: the perfect balance of simplicity and elegance. It’s still the only restaurant that I’ve eaten at that had a real live car on the menu (the MG F thankyou, after dessert, of course). 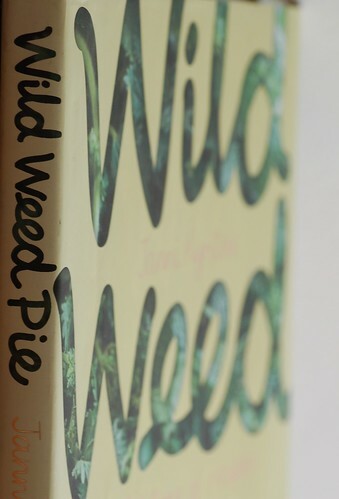 When Janni released his beautiful cookbook, Wild Weed Pie, I just had to get myself a copy. There’s something to be said for a chef that waits until later in his career to put pen to paper to chronicle his favourite recipes. Something about the experience and maturity that resonates from the pages makes this a very special book, a world apart from the modern flash-in-the-pan books put out by so many celebrity chefs. A book to treasure and savour rather than consume and discard. Inspired by Janni Kyritsis in Wild Weed Pie. Janni and I share a love of garlic. The slow cooking in oil renders the pungent bulb nutty and deliciously sweet. For those of you worried about garlic breath, I can testify that I unthinkingly served this for dinner the night before a hot date to no ill effects. 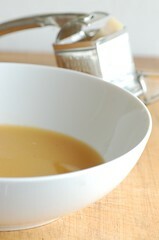 This is quite a simple soup so the quality of your chicken stock really makes all the difference. Place oil and garlic in a large saucepan and bring to a simmer. Cover and cook very gently for approx 25mins or until garlic is very soft. Add stock, thyme and salt and simmer for a further 15mins. Puree in a food processor until very smooth then strain back into the saucepan. Bring back to a simmer and season well. Divide between warmed soup bowls and serve hot topped with grated cheese. There are two things I love about this moussaka: serving in individual dishes and only frying half the eggplant. Both make for a much more elegant and less oily dish. You could, of course, bake in one large dish if you prefer. Preheat oven to 200C. Place half the eggplant on a baking tray and 1h 15mins or until eggplant is very soft. Allow to cool. Place tomatoes cut side up on another baking tray and drizzle with oil. Season well and roast on the shelf below the eggplant for 1 1/2 to 2 hrs or until shrivelled but still slightly moist. Heat butter in a large frying pan and cook onion over a medium low heat for 10mins or until softened but not browned. Halve the roast eggplant and scrape out flesh. Discard skin and coarsely chop flesh. Add to onion with cinnamon and cook for approx 10mins or until just starting to brown. Slice remaining eggplant into 5mm rounds and sprinkle with salt. Allow to stand for 30mins to draw out some of the moisture. Wipe down with paper towel to remove most of the moisture and salt. Place enough oil for frying in a large frying pan to make a layer approx 1cm deep. Heat until very hot and fry eggplant slices in batches until well browned on both sides. You may need to add more oil between batches. Allow fried slices to drain on paper towel. Combine parmesan, half the gruyere, ricotta and cream in a small bowl and season. To assemble, divide half the fried eggplant slices between 8 one cup capacity ramekins to make a layer on the bottom of each. Divide half the onion and eggplant mixture between the ramekins and then top with the roast tomatoes. Cover with remaining onion mixture and sprinkle over the pinenuts and remaining gruyere.Â Finally cover each with a layer of the cream & cheese mixture. 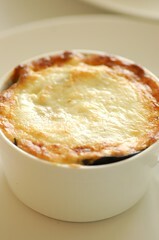 The moussaka can be made ahead up to this stage and refrigerated for a few days until you are ready to serve. 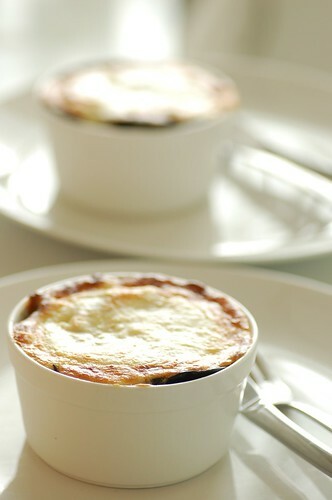 Allow ramekins to come to room temperature. Preheat oven to 220C and bake for 30mins or until golden brown & sizzling. Serve immediately. Whisk together vinegar and oil in a large bowl and season well. Toss through all ingredients except olives and feta. 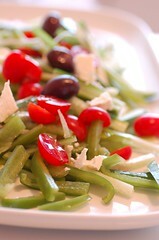 Arrange on a serving platter and crumble over feta and sprinkle olives. I’ve long been a fan of Stephanie Alexander’s twice baked goats cheese souffle as a main course but had never thought to try a sweet option. I took Janni’s tip and served them as ‘puddings’ rather than souffles. Sometimes cooking, like life, is about managing expectations. Since the cocoa powder is your only source of chocolatey goodness in the puddings it’s really critical that you use the best quality you can afford. Preheat oven to 150C.Â Grease 8 xÂ 200mL tea cups, oven proof moulds, or ramekins. Sprinkle each with a little sugar. Whip egg whites until soft peaks form. Gradually rain in the sugar while continuing to beat and mix until smooth and glossy andÂ the sugar has dissolved. Sift together cinnamon and cocoa powder and gently fold though egg white mixture until only just combined being careful to minimise deflating the egg whites. Divide between the prepared moulds and place in a baking tray. Fill tray with boiling water to come half way up the side of the moulds. Bake for 40mins then turn the oven off and leave to cool with the door ajar. When cool, remove from the water batch and cover until ready to serve. The puddings will shrink down but this is normal. When ready to serve, preheat oven to 220C. Place puddings on a baking tray and bake 15mins or until puddings are puffed up and risen. Meanwhile make the chocolate sauce by bringing cream, water and salt to the boil in a small saucepan. Remove from the heat and stir through chocolate pieces until the chocolate is melted and the sauce is glossy and smooth. To serve place a scoop of icecream on top of the chocolate puddings and drizzle over hot chocolate sauce. Get them on the table ASAP. Lovely sounding dinner. I really like the idea of individual moussaka. I love this menu! In fact, i’ve been skimming through your past entries and all the menus and recipes sound and look lovely. I will definitely have to have a go at making the double baked choc puds! My vegetarian lover “LOVED” the Moussaka…fabulous!. Just happened to come over here from Dani’s post about garlic soup. First up, thanks again for the beetroot soup inspiration – did a Thermomix version with curry leaves. Great to see somebody who loves Janni. He is the most wonderful, humble person who not only cooks(cooked) but sewed his uniform as well!! The cookbook is beautiful and it is really thanks to Roberta Muir from Sydney Seafood School that it happened. Think it is explained in the intro along with the fact that he used Margaret Fulton’s cookbook to learn English. I have become very addicted to this soup. It’s superb.